This season, the leaves are changing, the air is getting crisper, and the big brands are taking it outside… Outside of the home, that is. When deciding how to build excitement and promote tune-in for the new fall schedule, Fox chose to move away from the TV commercials to focus on OOH, taking advantage of traditional formats along with digital billboards and networks. The driving factor behind the new move to digital? — the ability to show full-length pilots for some of this season’s lineup, such as “Raising Hope” and “Lone Star”. Full pilots ran on three major airlines, the Hotel Networks and Princess Cruises, and street-level video networks at subway stations. 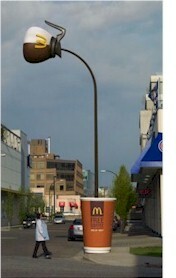 Once again, McDonald’s has found another creative and attention-grabbing way of showcasing their coffee. This time the stunt took place in three Canadian cities for two weeks as a way to encourage people to stop in for a free cup of coffee. 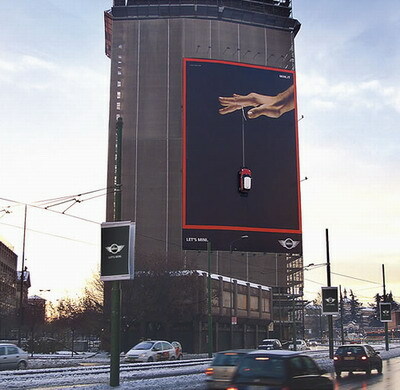 Whether driving, walking or looking on from a local building, the ad was impossible to miss. Suspended 50 feet in the air was a giant coffee pot pouring a stream of coffee into a 7 ft tall cup (complete with the new cup design, of course). Like I said, this isn’t the first time McDonald’s has put their coffee in the spotlight using an amazing and larger-than-life stunt. 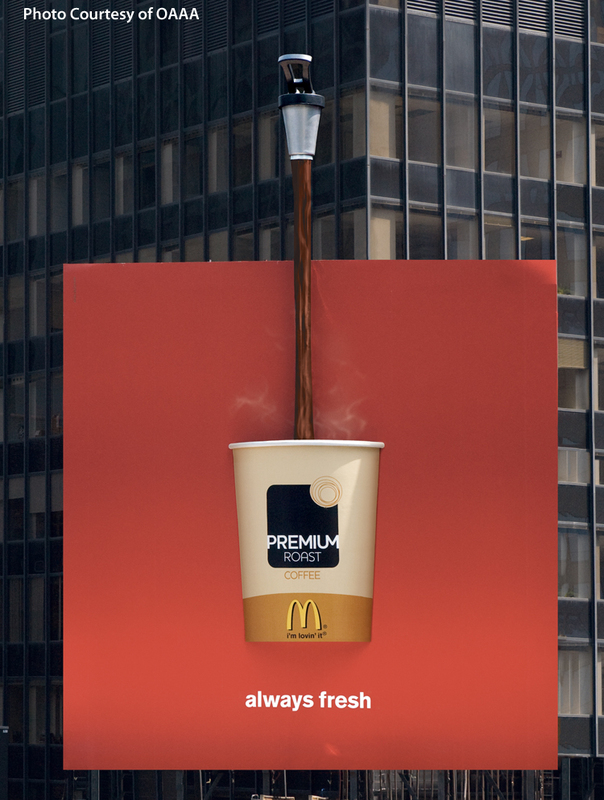 Earlier in NYC’s Times Square, the fast food chain raised an installation on the side of a building that included a giant spigot pouring hot coffee into a massive McDonald’s cup below. It’s no wonder McDonald’s did well in the OBIE Awards. 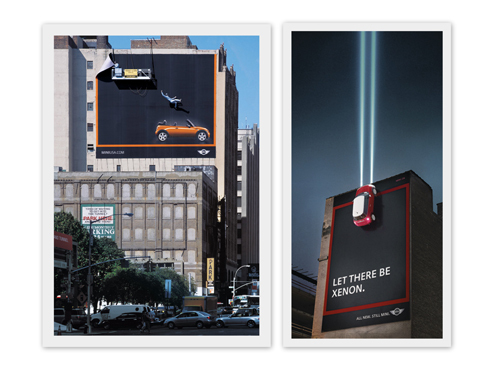 They’ve done an incredible job of creating campaigns that are truly memorable and really stick with people. In today’s world, ads are everywhere. 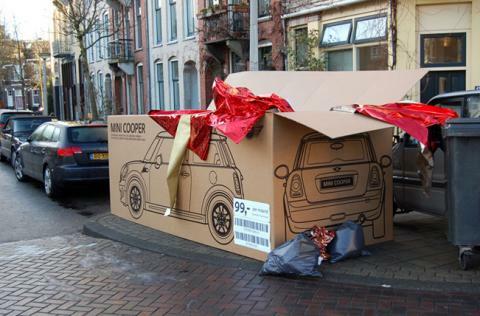 To be effective and catch the eye of consumers, an ad has to bring a little something extra to the table, give people a reason to notice. Submedia’s recent campaigns for Dasani water and Coca-Cola did just that, literally stopping people in their tracks. It’s rare to find ads that people get excited about. That’s why Submedia’s work is always so effective. 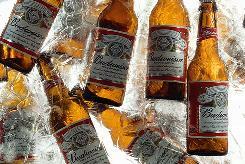 They bring advertising that is fresh, innovative & entertaining. Take the Dasani and Coke campaigns, for example. Using storefronts, Submedia created 3D interactive displays that actually moved with passersby. In that way, they not only caught attention, but actually got people interacting with the ads… to the point that some were even running up and down the sidewalk. Well done, Submedia! We can’t wait to see what you do next. Find out more about Submedia’s walking motion picture displays and more.